Fury was known as "Highland Dale" where he lived on a farm in the town of Joplin in the state of Missouri of United States of America. 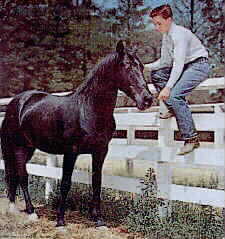 Fury was only 18 months old when he was discovered by Ralph McCutcheon a trainer of animal motion picture stars. Mr. McCutcheon sensed Fury's potental for movie fame. 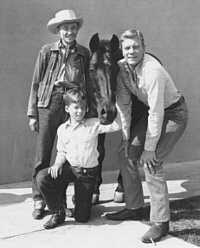 It was syndicated from 1959 on, under the title "Brave Stallion" then Rerun on NBC 1960 - 1966. 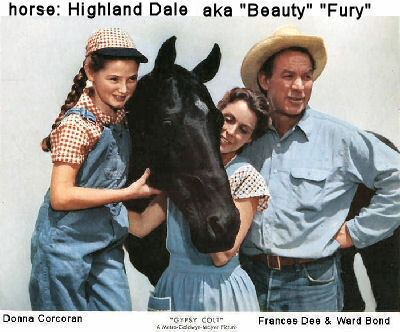 Fury lived at the stables in Van Nuys, California then was taken to Sand Canyon an area in Santa Clarita, California then known as Newhall-Saugus California in the 1960's. (all places are in Los Angeles county) Fury and Mr. McCutcheon retired at Sand Canyon ranch. The ranch had approximatly 5 acre paddocks and an arena. A new generation of horse movie stars may have come from the ranch. Through the years children visited the ranch to learn all about horses & how they are trained and had horse shows there. Fury had other companions: cattle and dogs. I once saw Fury out in the pasture at the Sand Canyon Ranch grazing the greens in 1969 as we drove by. I moved away from California so I don't know if Fury is gone, probubly so, but he was a talented horse. 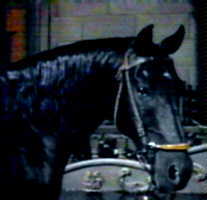 Fury was 26 months old when starred in "Black Beauty" . Note there have been alot of Black Beauty movies & TV shows through the years. Also Fury was in a movie called "Gypsy Colt", this is where Fury was known as "Gypsy". That made Fury top animal star. The script requirement asked for many tricks and Fury was ready with every one. After the success of those movies Fury was cast as the black stallion in "Giant" . 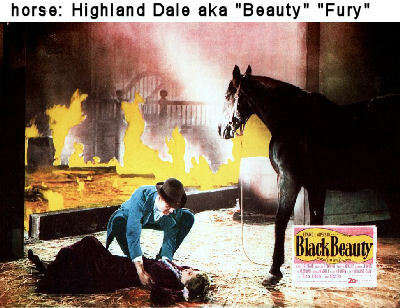 Highland Dale, to Beauty, to Gypsy, to Fury depending on what movie was popular at the time that was what he was called. Only Ralph McCutcheon knows for sure. Fury the big star horse of Hollywood, and one of the smartest loved to be bathed and curried, especially when its hot. Temperatures in California in the summer range 87 - 103 mostly, and dry. The heat from the sandy soil radiates more heat. Fury would take advantage of his breaks between scenes he would roll in the dust. The wrangler crew would be hot too then have to hose Fury down and curry him. Fury enjoyed doing this and appear to laugh at everyone. Fury won Patsy Awards, they are given to the animals as Oscars are to people. 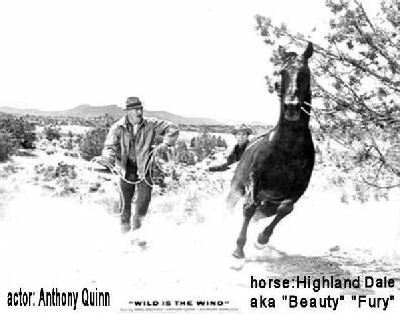 In 1958 for the movie "Wild is the Wind", he was 2nd place winner. 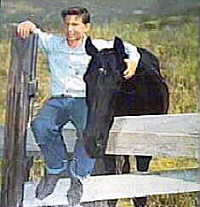 Another in 1955 for "Gypsy Colt" as 1st place, then was 3rd place for the "Fury" series in 1960 & 1961. Note: Loretta knew the movie horses, trainers & owners. I noted you listed Fury as a possible horse in the Bonanza series for Adam Cartright's horse. 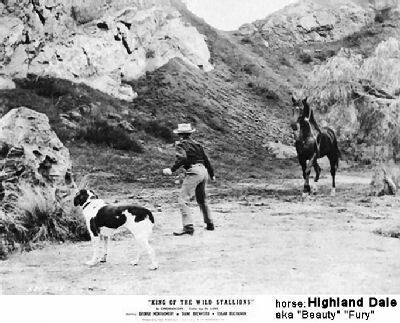 Alas, it was not Fury, but a horse owned by Fat Jones, who owned the Fat Jones Movie Stable in North Hollywood, California. 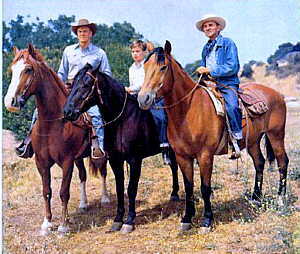 Fat owned all of the Bonanza horses, plus several others who were cast horses, such as the National Velvet horses and Black Diamond, who looked very similar to Fury but was trained by Les Hilton. I was fortunate to live directly across the street from Les and learned from him about horse training. 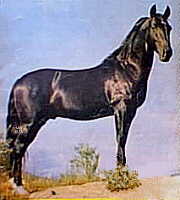 Black Diamond was used as a wild stallion in many movie roles. He also was not the black horse Pernell Roberts rode, whose name escapes me for the moment. Hollywood had a love affair with black horses. Lassie also lived down the street from us, as did a circus and another carnival. My father owned a carnival and a set of pony tracks. 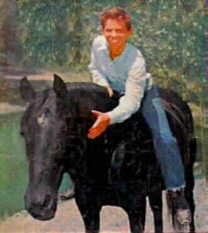 His ponies were used in many of the movies and televison series. 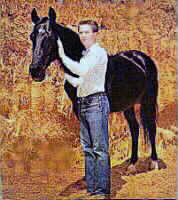 Another black horse I remember belonged to the Hudkins Bros. Movie Stables. 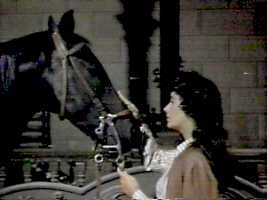 He was paired with a white stallion and the duo were usually the "wild stallions" used in the horse fight scenes. There were several movies stables in the San Fernando Valley then which were located on Parthenia in Panorama City, California. Fury lived in a shed row barn, with only three stalls and a tack room in it. The only other occupant of that barn was King Cotton, who was right next door to Fury. If my memory serves, Ralph kept the area in front of the barn roped off to a distance of about twenty feet. When I asked why, I was told it was because Fury was so mean. However, looking back, I don't believe this. I never saw any meanness on Fury's part and I think it was a convenient lie which kept people from bothering him while he rested. Fury suffered from heaves for most of his life. This is a disease similiar to asthema, and the name comes from the heaving action of the rib cage as the horse struggles for breath. It is triggered by dusty hay, so Fury's hay was always wet when he ate. This was before hay pellets were invented. These pellets were a real boon for horses with heaves, since the dust was decreased considerably.